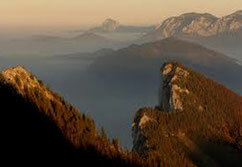 We will leave early in the morning to expolre the so called Austria lake district "Salzkammergut"! 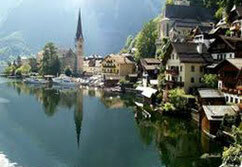 The Salzkammergut fulfils the ardent desire for vitality and zest for life! Magical mountain world rich with evergreen forests and 76 unfathomably deep lakes, all with crystal clear water... Hidden valleys, mighty glaciers and secluded trails. The landscape is some of Europe’s finest and the area is a true magnet for those seeking the best of Austria's Baroque heritage and a taste of subalpine scenery. Salzkammergut is a region of glaciated lakes and craggy peaks, straddling the border between the provinces of Salzburg and Upper Austria. The lofty peaks and the glacier-carved troughs that separate them make for some spectacular scenery. After our obligatory footsteps in Traunkirchen, St. Gilgen and where ever you want to, we move on to the city of Salzburg. Salzburg's spoiled residents often fail to notice the unique charm of the Old City – a backdrop that's easily overlooked in every day life – until their guests are enraptured by its breathtaking beauty. The city of Salzburg - and especially its historic city center – is in fact one of the loveliest places in Europe, winning international acclaim in 1997 when it was designated a world heritage site by UNESCO. Your fantastic private guide will show you all this marvelous sights of the old city like: the Cathedral, Hohensalzburg Fortress, the Residenz, St. Peter's Monastery with its impressive cemetery, the Franciscan Church and Collegiate Church as well as the Large and Small Festival Halls and the Summer Riding School in the Festival District. On the right banks of the Salzach one should not miss Mirabell Palace with the romantic Mirabell Gardens (one of the city's most popular snapshot scenes, known from SOUND OF MUSIC) or St. Sebastian's Church with its charming cemetery. And finally the main sight of Salzburg, Mozart Birthplace! After the walking tour you can spend a couple of hours in Salzburg for lunch, to do some shopping or to explore the city further on your own. 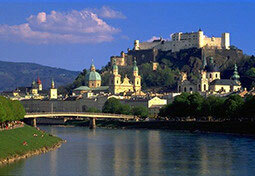 Visit the Mozart museum or take a ride in the funicular up to the impressive fortress of Hohensalzburg. In the late afternoon your private guide will take you to Vienna and back to your hotel. Enjoy the superior service and the personal atmosphere of this unique private tour to Salzburg.